It wasn’t long ago that food trucks first started making waves in Lincoln. You probably know one of the first: Heoya [Facebook], an unassuming white van with a perky pink pig painted on the side. Soon Heoya established a brick and mortar presence inside the U-Stop at 33rd and Superior. Lincolnites continued to line up. The folks behind Heoya weren’t done. Introducing Qilin (pronounced “chillin’”), a new Asian fusion restaurant that takes what the Heoya folks have learned about the food business and applies it to a more traditional dining atmosphere. The Missus and I recently checked it out to see how they’ve done. Overall it’s a mixed bag, but read on to find out what that means. Let’s start with some bad news. 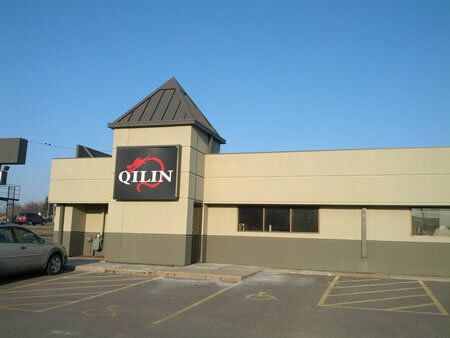 Qilin is located on the south side of O Street just west of 84th. 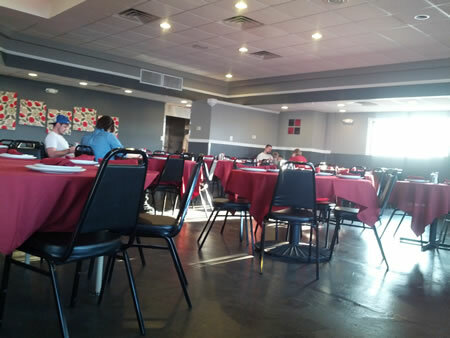 Longtime Lincolnites will recognize the building—it has held a variety of sports bars and Chinese buffets and who knows what else over the years. That doesn’t necessarily mean the same will happen to Qilin, of course, but some locations around town just carry more baggage than others. This is one of them. It’s also a huge space, especially for a brand new restaurant. I hope they got a great deal on rent. On the plus side, there’s quite a bit of new activity going on just across the street. That may mean there’s some good momentum in the area, and hopefully it carries over to Qilin. The exterior of the building has been freshly painted and there’s a nice sign mounted on the building. Unfortunately the tall sign along O Street is still blank, making the restaurant easy to miss. I hope they’re working on that. It would also be nice if they worked on their entrance. One of the two doors is broken and the area around the entryway outside could use some cleaning up. It’s not trashy or anything, but things like broken concrete and door stickers left over from previous tenants don’t give the greatest first impression. When we walked in we were greeted immediately upon entering and quickly seated. If there is a wait, there is an ample waiting area. I love the color scheme inside. The color palette features grays, white and black, with red accents. I am not crazy about the table layout, however. The dining area is wide open and almost cafeteria-like. That immediately knocks the atmosphere down a couple pegs. They would do well to invest in some booths and partitions to help divide the space and provide privacy for those who want it. So there you go. The location isn’t the best and the atmosphere is mediocre. Things get better from here. Much, much better. Our server, Dawn, was excellent. She was friendly, attentive, and knowledgeable about the menu. In fact, it was on her recommendation that I selected both our appetizer and my main course. The other servers appeared to be doing comparably well, though of course that’s difficult to judge with much precision. There were two minor hiccups. The first is that somehow we acquired a tremendous number of dishes over the course of our meal. That was largely due to the nature of the items we ordered, but they should be cleaned up as much as possible as the meal progresses. Second, both our entree and that of at least one other table arrived too quickly. Kudos to the kitchen for their efficiency, but the food’s arrival should be better paced so that it doesn’t overrun the prior course. 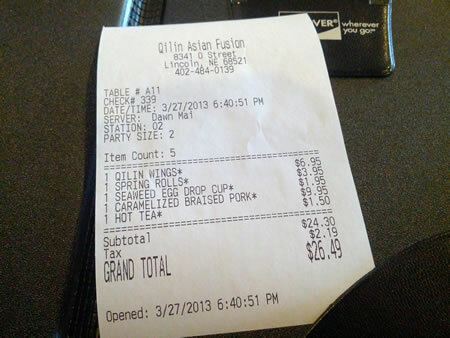 Qilin’s menu [Facebook] is diverse and exciting and unlike any other menu in Lincoln. It includes interpretations of Americanized Chinese classics like beef with broccoli ($10.45) and kung pao chicken ($9.45) alongside more unique dishes, including black bean clams ($10.95), seafood ceviche ($10.95), and Chinese water spinach ($7.95). Whether you want to play it “safe” or experiment a bit, you’ll find something for you. You won’t, however, find a children’s menu. That may be problematic. I’d like to see them offer smaller, simplified versions of a couple dishes (pad thai, for example) for the kiddos. I have craved chicken wings for weeks now. When Dawn recommended the wings ($6.95) as an appetizer I was quick to say yes. 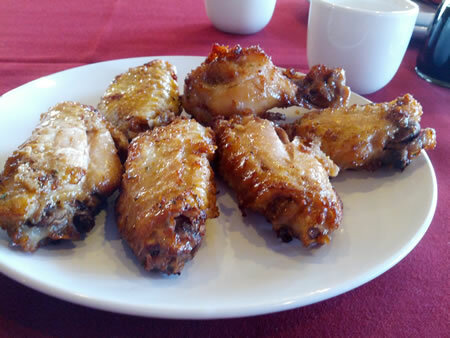 The six wings were nicely cooked and coated with a pleasant, relatively subtle Asian flavor. Dawn warned me in advance that the wings were a “dry” style; they were anything but. What she meant, of course, was that they don’t come dripping in sauce, and that’s quite true. The lack of tastebud-assaulting flavor and goopy sauce was a welcome respite from the norm. The Missus ordered spring rolls ($3.95) and a cup of seaweed egg drop soup ($1.95). 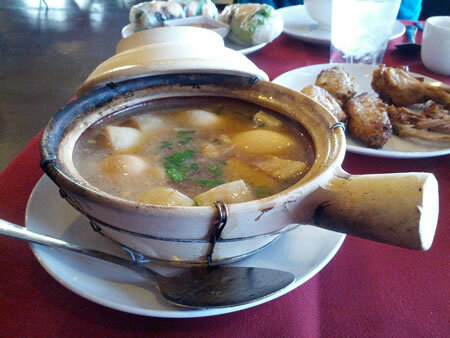 The spring rolls were very similar to those offered by Heoya; in fact, they may be identical. 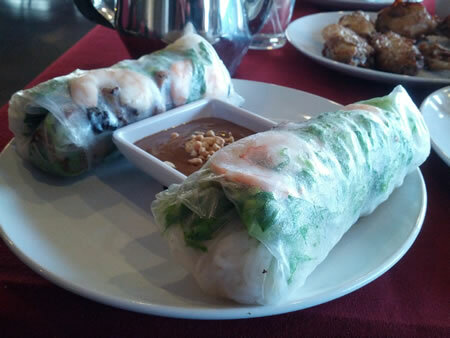 They include rice, pork, shrimp, and lettuce wrapped in rice paper and served with a delicious peanut sauce. Do note, as you can see in the photo above, that these spring rolls are not the tiny, fried creations you may have had elsewhere. If that’s what you’re expecting you’re in for quite a shock. 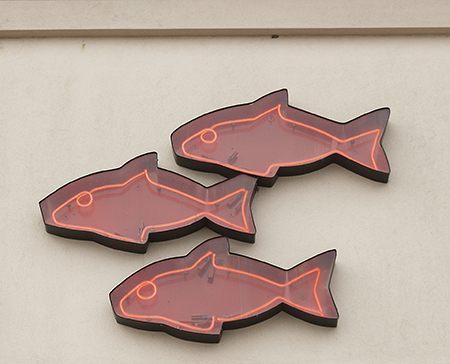 They are fresh, filling, and definitely not fried. Meanwhile the soup is a spin on the standard eggdrop soup you find at most Chinese restaurants. 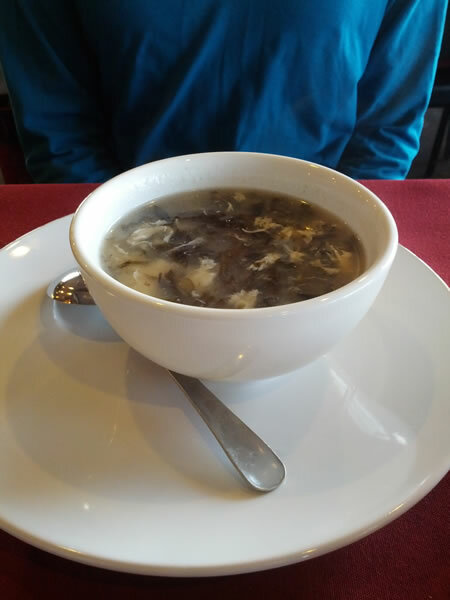 This soup is on the lighter side and it includes seaweed—something you won’t find much of in Lincoln, Nebraska. Don’t let that scare you off, though. It’s delicious. I went with a dish recommended by Dawn. She described the caramelized pork and eggs ($9.95) as a comfort food, comparable in role to meatloaf in Midwestern culture. Once it arrived I understood what she meant. The meal arrives very hot in a clay pot. Inside is fatty pork, hard boiled eggs, and an absolutely fantastic savory broth. I should be clear here: when the menu says “fatty pork”, it means it. Most of the pieces of pork were as easy to cut as warm butter. It’s an excellent cold weather dish, high in fat and protein. The Atkins and paleo crowds will no doubt love it for that reason. I love it for the simple reason that it was really darn tasty. At the end of the night our bill came out to just $26.49. That’s perfectly reasonable for the quality of food and experience we received. Next comes a question that I don’t quite have an answer to: Where does Qilin fit in Lincoln’s dining scene? At this point I’m not sure. The building and layout are flawed as I’ve already pointed out, almost on par with a sports bar (but without the televisions). Meanwhile the color scheme, table cloths, and table settings imply a much higher aim. And the food ... the food is absolutely fantastic. It’s almost like Qilin wants to compete with the Blue Orchids and The Ovens of Lincoln but it’s not quite sure how to get there. It’s stuck in limbo. I’m not sure what I think about that. I’m also not sure that I care. For me the two most important components of a restaurant are the food and the service. I can usually forgive the rest. Heck, three of my favorite Mexican (-ish) restaurants have huge flaws: Oso is too cold in the winter; El Chaparro is an ugly dive; and Cristina’s (in Crete) is stuck inside a former Sonic. Qilin is off to a great start with its service, and I’m running out of superlatives to describe my opinion of the food. I’ll be back. If Qilin can get a stream of customers coming in the doors, they’ll all come back, too. Construction has proceeded relatively smoothly as the Pinnacle Bank Arena nears completion for this fall’s opening. Alas, we knew it wouldn’t last. There were some fireworks late last week, and they’re worth a second look. Earlier this year it became clear that there would be some opportunities to accelerate development of the West Haymarket area. 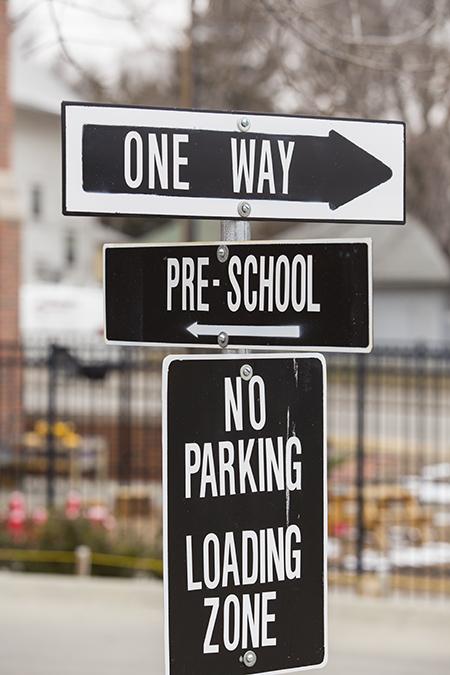 Businesses are interested in moving into the area, but to make that happen they would need parking. Conversations began about the construction of two additional parking garages in the area. Those two garages were not part of the original Haymarket redevelopment plan so they were not part of the original $344 million (now $346 million) budget. An extra $30 million would be needed. And that’s where the sparks started. 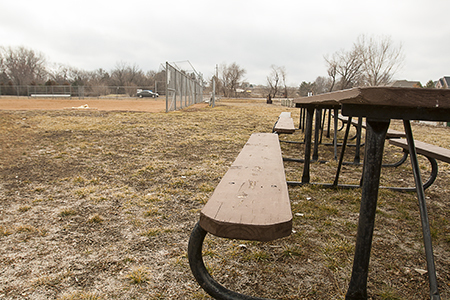 Late last week, Mayor Chris Beutler and Regent Tim Clare—both members of the JPA—got into a spat over the extra funds. Beutler thinks they’re a no-brainer; Clare says we should slow down and think about this. Eventually Councilman Gene Carroll sided with Beutler and bam, taxpayers are on the hook for the extra costs. It’s an interesting problem. On the one hand there’s no doubt some partisanship going on. Democrat Mayor Beutler, for example, has publicly accused Republican Clare of being “anti-business”—a charge more often levied the opposite way ‘round when the two parties are involved. Meanwhile Clare wants transparency, which he argues has been lacking because of the speed with which these garages were proposed and approved. The so-called “Phase 2” of the redevelopment is not widely known or understood by the public. In fact, there’s reason to believe it’s not even widely known or understood by the JPA or other interested parties. Unlike with “Phase 1”—the arena, the new streets, The Yard, et al.—you won’t find detailed Phase 2 documentation anywhere. Thus Mayor Beutler’s “anti-business” charge is not only childish, it’s downright ridiculous. There’s nothing “anti-business” about wanting a plan. The JPA itself is already an end-run around the public participation process. Anti-business or not, the responsible thing to do is slow down and ensure that the next steps—“Phase 2” and beyond—are as well thought out as those already underway. That’s just good sense. “Are we on budget?” Clare asked Lincoln Finance Director Steve Hubka. “We are on budget today, provided you adopt this budget,” Hubka replied. That’s not an approach driven by planning and organization, it’s one driven only by cashflow. It is a reckless and dangerous way to advance a project that to date has been something Lincolnites can be reasonably proud of. Lincolnites need to begin demanding information about this “Phase 2”. What is it? What are its goals? What is its scope? And perhaps most importantly, are we absolutely certain we’ve taken care of our obligations with Phase 1 first? Mayor Beutler owes the community an explanation before he and the JPA charge ahead any further. Happy Pi Day, nerdy Lincolnites! Pi Day, for those of you not in the know, is celebrated each March 14 (3/14) in honor of everybody’s favorite ratio. And how better to celebrate than with pie? That, of course, begs the question of where in town to get the best pie. Honestly I’m a bit stumped. I’m not much of a pie guy myself so my experience here is pretty limited. At the top of the list, from what I understand, has to be Stauffer’s Cafe & Pie Shoppe just south of 48th and Highway 2. Their pie list varies each day so you may as well go see what they’re offering today. The Eatery (South 48th between Van Dorn and Normal) has daily pie selections to fill you up. And of course there’s Village Inn, with locations all across town. What are some other pie destinations around Lincoln? I don’t know for sure if CASA (Court Appointed Special Advocates) should receive $500,000 annually in state funding. I do know that CASA provides a fantastic service. In short, CASA volunteers accompany children as they make their way through the foster care system. Foster children meet and interact with all kinds of people during their time in the system—foster parents, guardians ad litem, case workers, parents’ attorneys, and so on. Many of those faces change over time, and some change very frequently. For example, our case involved SIX different DHHS case workers just in the last 12 months before the adoption. Over the entire lifespan of the case there were something like two dozen people involved. CASA’s volunteers are a consistent presence through all of that. They provide consistency from one foster home to the next, from month to month and year to year. Our CASA volunteer provided critical insight into our case’s history that nobody else could or would provide. She was a face our boys recognized from their first day in the system to their last. 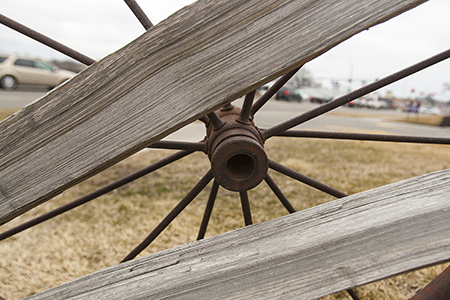 Nebraska’s child welfare system has oh-so-many weaknesses right now. Some of those are being worked on thanks to the Unicameral’s tireless efforts (and no thanks to Governor Dave Heineman). Taxpayers have been asked to pay up a lot of money. Now LB126 asks for even more. Based on what I know about CASA, it seems like a bargain to me. Let your Senator know if you agree. Parking meters Downtown have been upgraded to machines that accept credit cards. At the same time, the new parking rate of $1 per hour has gone into effect. It’s about time. It’s the first time parking rates have changed since 1995. Don’t expect this price point to stick around for 18 years. I know a lot of folks like to whine about parking Downtown, but in general it’s really not that bad. You just need to go in with two expectations: first, that you’re probably going to have to walk one to three blocks; and second, that if you manage to snag an on-street spot, it’s probably not going to be in your ideal location. When I venture Downtown I’m amused by the lengths of time people will spend trying to find that perfect metered spot. It’s a foolish exercise, a tremendous waste of time and energy. It’s even more absurd when you factor in the First Hour Free promotion at the various garages scattered across Downtown. Garage parking can often be cheaper and get you closer to your destination. But enough of that advocacy. The important thing to note here is that you’re going to be out a buck an hour if you park at a meter Downtown, but at least you can pay with plastic. Next up: paying by phone. The original study, done in 2001, is long outdated. And the latest traffic counts have changed the road design. Six lanes likely will be needed eventually, so plans would include a wide center median to be available when that time comes. The original plan didn’t account for eventual expansion to six lanes? That’s mind-blowing and entirely inexcusable. Lincoln made yet another “best of” list. This time Lincoln is #1 in Gallup’s “Well-Being Index” (PDF). Or as the Journal Star puts it, Lincoln is the happiest place in the U.S.
Is it really true? I doubt it. These sorts of surveys and indexes are based on one organization’s definition of whatever it is they’re purporting to rank. It’s a fuzzy process prone to all kinds of problems. We could casually dismiss these results and move on. After all, Washington, D.C. made the top 10. Anybody who thinks D.C. is a happy place is delusional. (The index actually uses the entire D.C. metro area in its rankings; neighboring communities are orders of magnitude better off than D.C. itself.) Certainly the reaction on Twitter and in the LJS’s comment section leans sarcastic. But that’s mostly the squeaky wheels talking. We oughtn’t toss these measures aside. Instead, look at them in bulk. Have you noticed how many “best of” lists Lincoln is on these days? We have low unemployment, low cost of living, low crime, great schools, great parks and trails, a steady economy, a strong music scene, and more. Those factors come together to move Lincoln up all kinds of lists. Although any individual “top 10” list might be little more than a garbage press release, collectively they represent something pretty fantastic. We should be proud of that. I know I am. in the United States, we’ve got a pretty good thing going. I’m happy about that. It’s insulting to think that a bunch of people, with all your degrees, and you’re all working together, and this is the best you could do, man. ... Why can’t you get the point across on something that should be so easy without having to push through something that’s just ridiculous?